Marugoto, is a textbook developed by the Japan Foundation. In Marugoto, using Japanese to actually communicate is the goal. The goal is not just to increase your knowledge of grammar and sentence patterns. Can-dos are set as objectives that show what you will be able to do in what situations, and you study Japanese that can be used in real-life situations. To know more about it, please visit Marugoto Site here. You can buy the first two levels of Marugoto textbook in India. 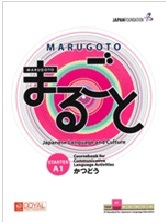 Please go to Goyal Publishers Website and search for Marugoto. If you are interested in teaching Marugoto, join our Facebook page below get connected with us!